Kids have an insatiable appetite for all things gooey, sticky and fun to eat. The problem with these foods is that they are no treat for the teeth because plaque can quickly rear its ugly head. Plaque is formed by bacteria in the mouth and, when sugar is present, the plaque becomes glue-like and bonds to the teeth. Sometimes, no matter how long or often a child brushes, plaque prevents teeth from looking white. But getting your child's teeth whiter doesn't have to mean white knuckles for you. 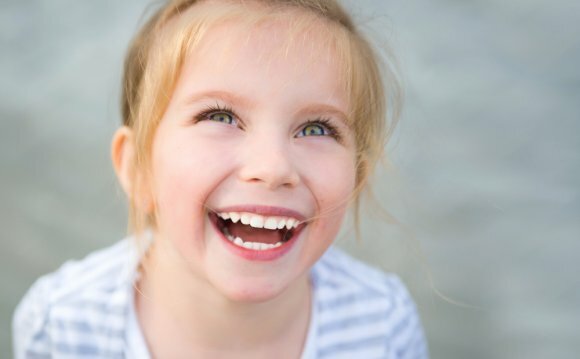 There are plenty of options to help your child achieve a sparkling smile. Visit the dentist. Children should see a dentist by age 1, according to The American Dental Association. If a child seems at risk for any problems, the dentist can apply topical solutions, such as fluoride, to help with future cavities, and she can also give teeth a good cleaning every six months or once a year. Brush twice daily with a pea-sized amount of whitening toothpaste with fluoride. This helps remove starch and sugar from the teeth so that the pearly whites can shine through. As soon as a child has two teeth that actually touch, it's important to show him how to floss properly. Flossing helps to remove plaque, which hardens eventually and turns to tarter. Until tarter is removed by a dentist, it coats the teeth and makes them appear yellowish. Purchase over-the-counter teeth-whitening strips for children with permanent front teeth - around 12 years old. Any younger and permanent teeth might not all be present, which can make the coloring inconsistent as teeth grow in. Use these hydrogen peroxide strips according to the directions; results take a few weeks. Ask your dentist if whitening trays are an option and check with your insurance to see if this treatment is covered. Trays are filled with 10 percent carbamide peroxide. The patient sleeps with the tray inserts for about four weeks. Research in-office bleaching if your kid's teeth need immediate whitening attention. The dentist will first apply a protective coating for the gums and then put on the whitening solution consisting of 15 to 35 percent hydrogen peroxide. The dentist or assistant then uses a heat laser to seal the solution.